Chiba, Japan, the capital city of the Chiba Prefecture, a city famous for the Chiba Urban Monorail, the longest suspended monorail in the world., and now… A REAL Batman. 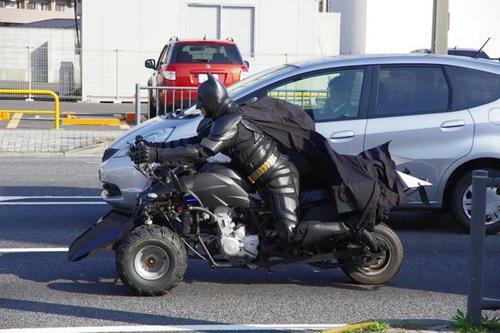 The newly dubbed “Chibatman” is reportedly a 41 year-old man who started patrolling around various Japanese motorways on a custom made Batpod while dressed as the caped crusader himself from the Dark Knight Trilogy around three years ago. The anonymous japanese man said that “after the great earthquake people forgot how to smile”, and he decided he wanted to try to bring the smile back to Japan. While this man does not fight crime and does not have to worry about a large rogues gallery of people who despise him, he does good work, trying to help the people of Japan become happy again. Below is the man aboard his Batpod and patrolling in a fashion that very well encapsulates the essence of Batman.